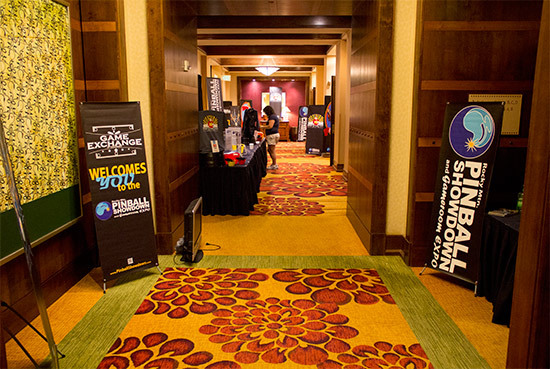 Location: Marriott Denver South, 10345 Park Meadows Dr., Lone Tree, CO 80124, USA. 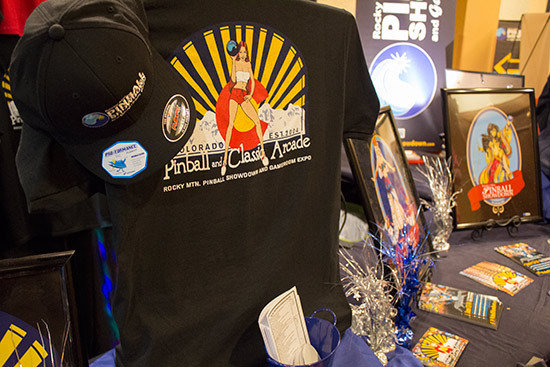 It's been a few years since we reported from the Rocky Mountain Pinball Showdown & Gameroom Expo, but we're back in 2015 and the show is at a new location in south Denver. 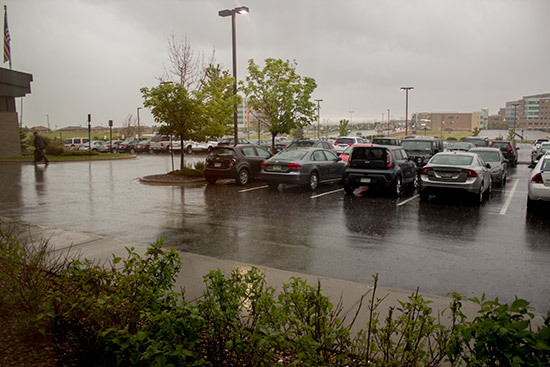 The weather in the Denver area has been pretty awful in the days leading up to the show, and despite a nice day on the Wednesday before the show, the heavy rain and thunder returned Thursday afternoon. 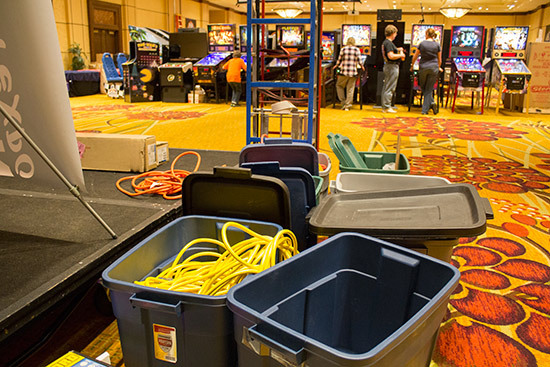 However, by the time the rain returned nearly all the games had been unloaded into the main show hall, so it had little impact. 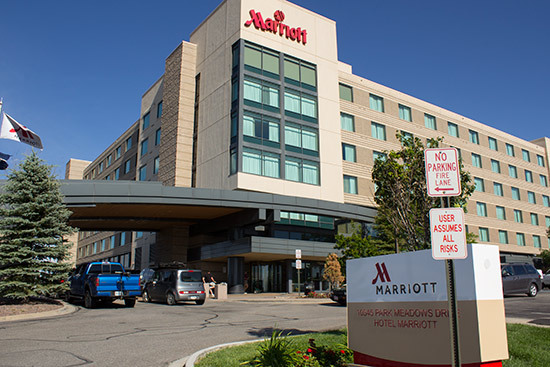 The Marriott is a good quality modern hotel and the show has taken over the main banquet hall and all the conference rooms. 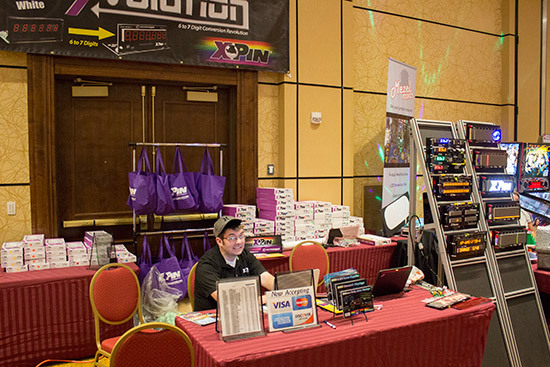 The registration and merchandise desks are the first thing visitors come to. 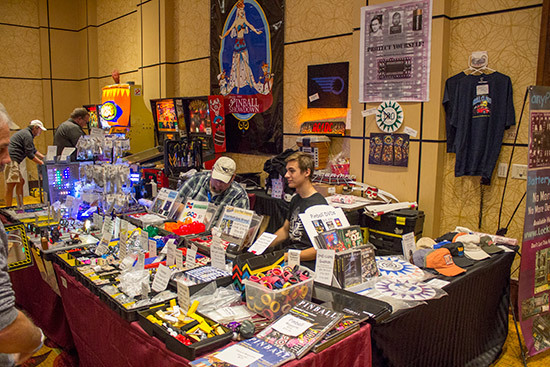 T-shirts, caps and other memorabilia was available once the show opened on Friday at 11am. The exhibit hall was still being set-up on Thursday afternoon when we arrived. 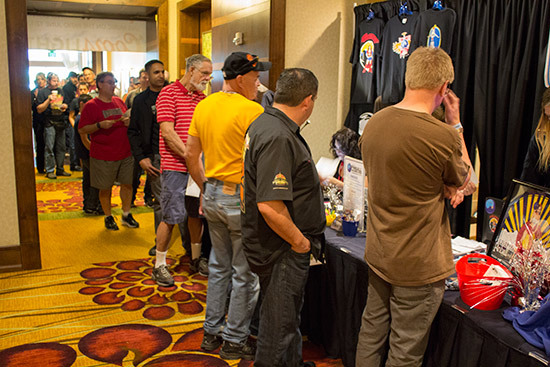 Friday morning rolled around, and just after 11am the doors opened and guests could buy or collect their wristbands at the registration desk. 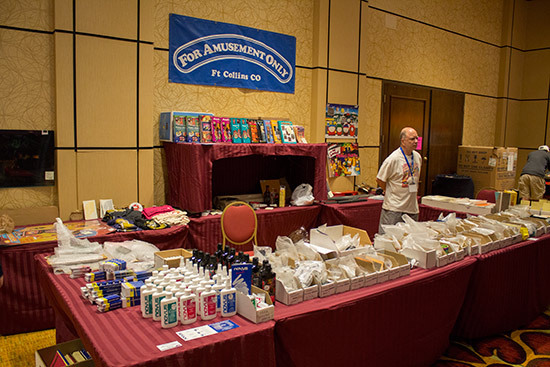 Inside the hall, the machines and vendors were ready. The machines were mostly in the centre of the hall, with the vendors arranged around the walls. 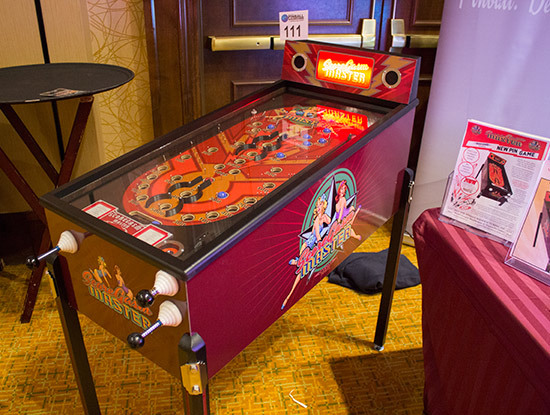 Working clockwise around the room, the first vendor was Jersey Jack Pinball who had a The Hobbit prototype and a The Wizard of Oz right next to the hall entrance. 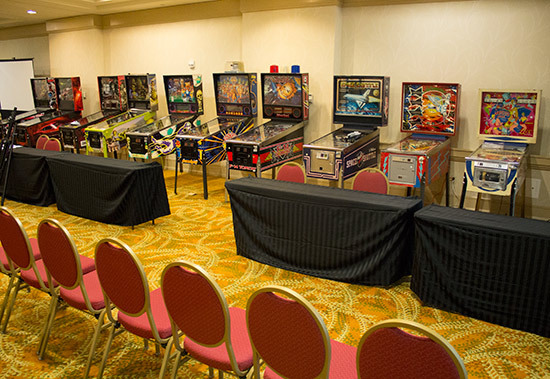 A side room contained more machines - both pinballs, vdeos and an air hockey table. 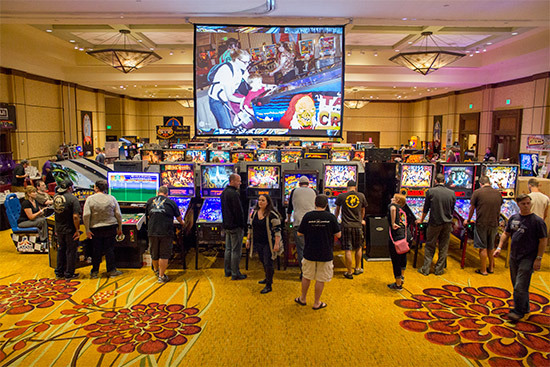 In total, we counted 123 machines on free play in the exhibit all, in the side room or in the tournament room, with another dozen reserved for tournament use. 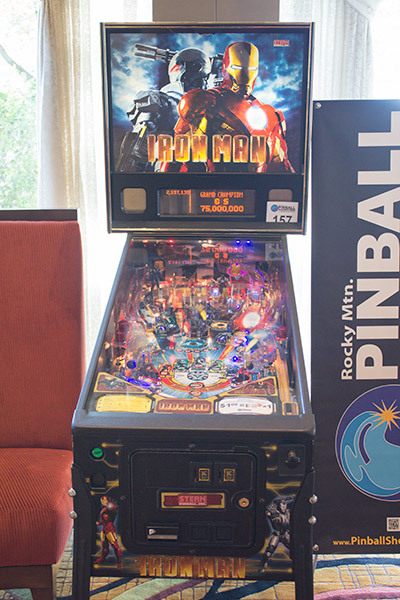 Finally, there was an Irom Machine set-up in the hotel lobby, but this was on paid play at $1 a game. 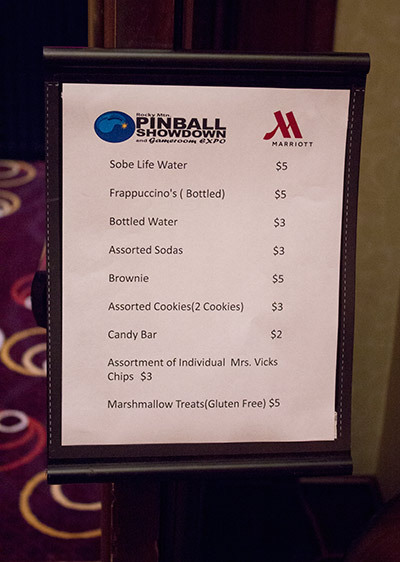 Anyone need in refreshments could purchase them from a small booth at the side of the hall. Soft drinks, chocolate bars and other confectioneries were available. Otherwise a restaurant and full bar were located a short walk away, while hot food was served at lunch and dinner time just off the side room.. 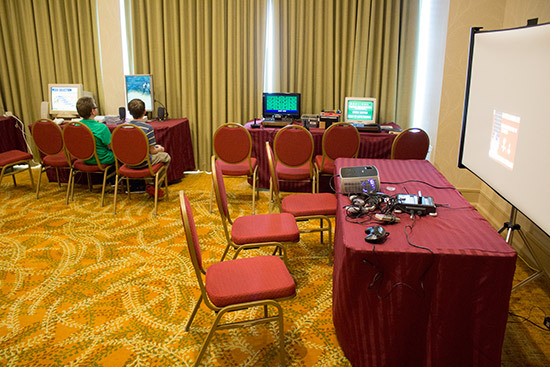 There were also several side rooms playing host to retro computing and console gamers. 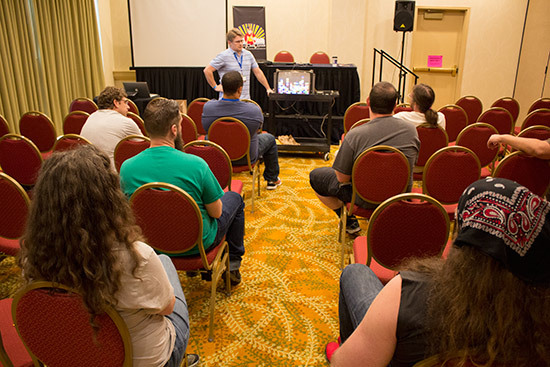 The first of the show's PinChat seminars was held in a small conference room near the main show hall. 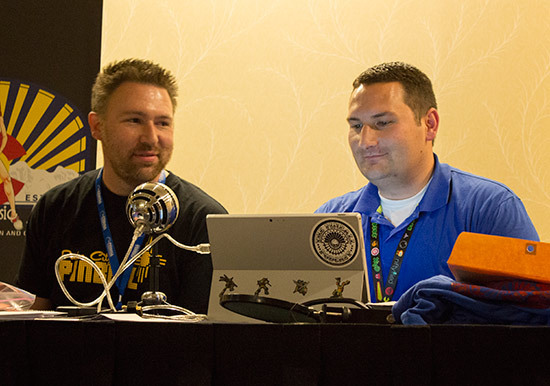 Aaron from CraftMech.com talked about and demonstrated how to diagnose and repair video game display problems. 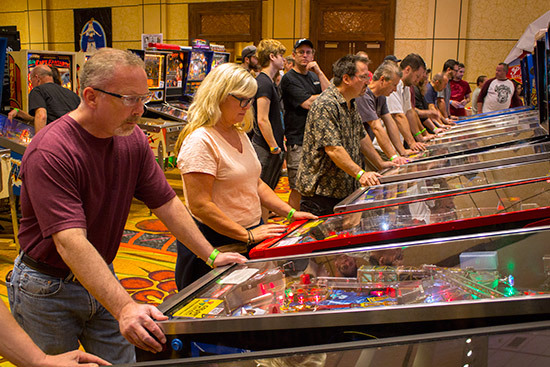 The first of Saturday's PinChats began at midday and featured Dennis Nordman and Greg Freres talking about their individual and joint pinball careers. 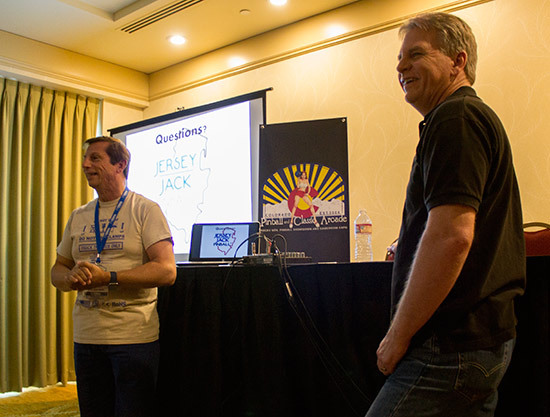 Greg began by talking about the Bally and Williams games on which he worked - either individually or in collaboration with Dennis - from Harlem Globetrotters and Fathom, to Revenge from Mars. 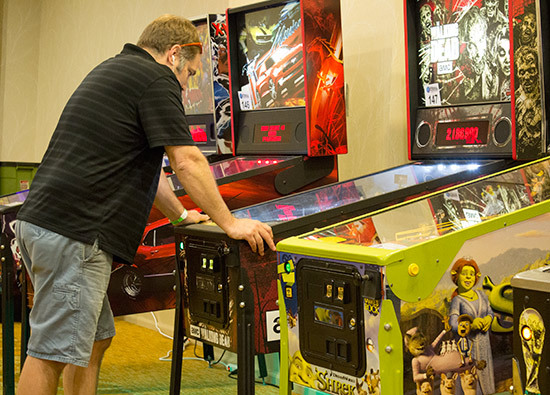 Dennis spoke about how he got into the pinball business through his cabinet designs and ended up at Bally alongside Greg. 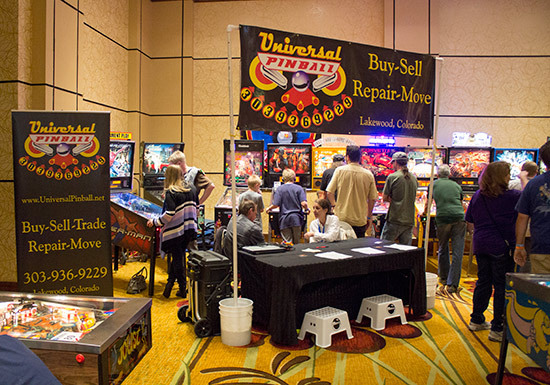 After Williams closed, they lost touch but met up again at a pinball art exhibition and then again at the NW Pinball & Arcade Show in 2009 where they discussed ideas for a collaboration. 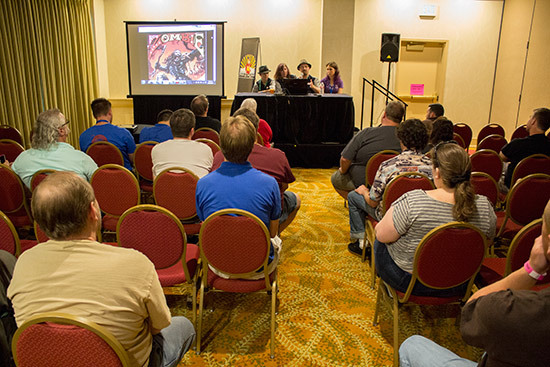 Dennis suggested re-theming an existing Continental Cafe EM game he had in his garage, and this ultimately led to the creation of Whoa Nellie! Big Juicy Melons. 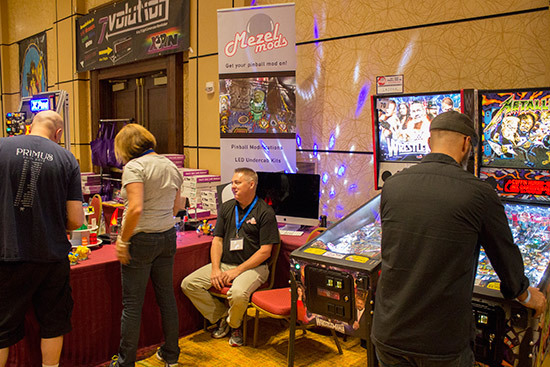 Greg showed pictures from the Stern factory of the game in production, saying he couldn't be happier with the way it turned out. 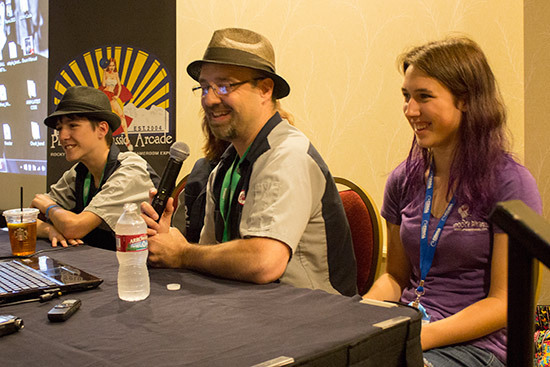 Click here to play the MP3 of these talks, or right click to download the file. You can also use the player below to play it within this page. 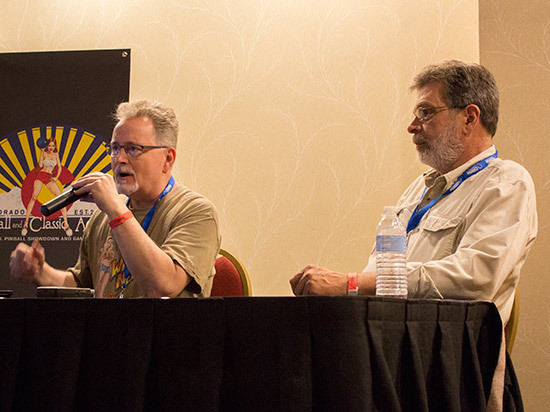 At 2pm the second Saturday PinChat brought Jack Guarnieri and Butch Peel to the stage to talk about their upcoming The Hobbit title. 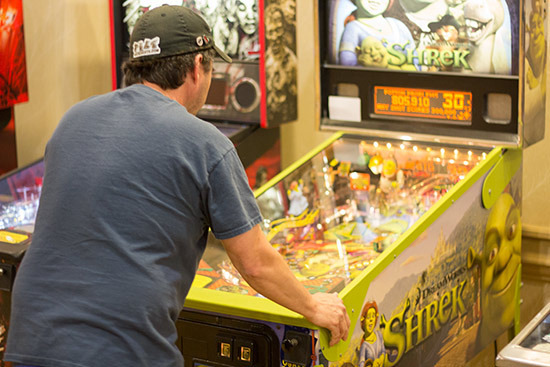 Butch began by talking about the changes made to The Hobbit's playfield and artwork since the first draft right up to the version show at Pinball Expo in 2014. Butch explained the modification made since that show, while Jack said they just had to make those changes even though it meant delaying the game. Some of the original ideas about Smaug interacting with the ball were rejected by the licensor as not being consistent with Smaug's character in the movies. 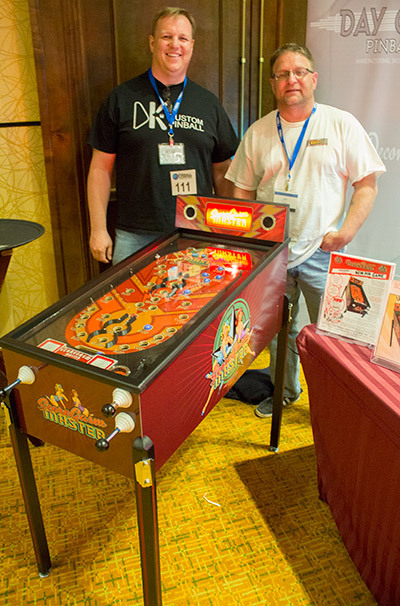 Jack and Butch had brought their latest prototype to the show which included flashers beneath the pop-up 'trolls', playfield flashers, and a Ring Button on the lock bar. 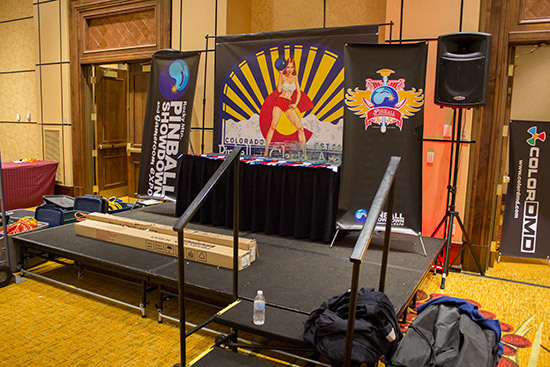 The third PinChat was a live recording of The Pinball Podcast. 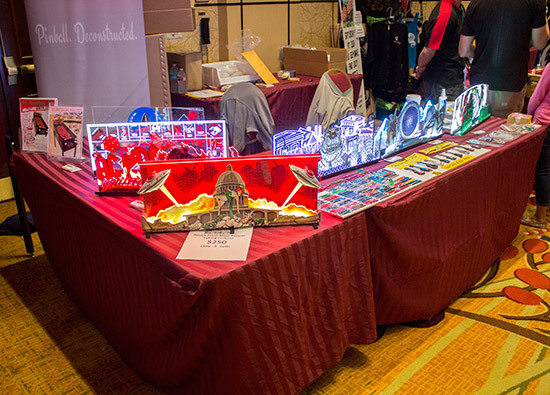 After a word from Nate from NiftyLEDs about his company's range of LEDs, Don and Jeff spoke about their favourite games at the show, such as Kiss, Scoregasm Master and Whoa Nellie. The duo then did a quiz, asking members of the audience to guess the name of the game from clues. 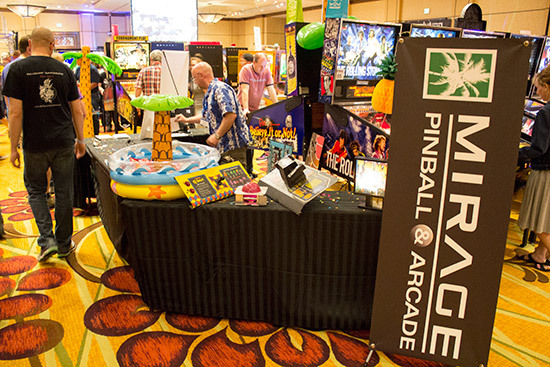 They concluded by listing the top five titles Spooky Pinball would not be announcing in the last PinChat. 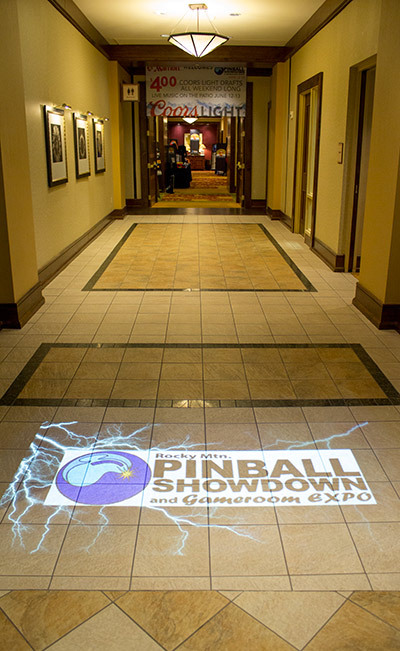 You will be able to listen to The Pinball Podcast Live in due course at their website. 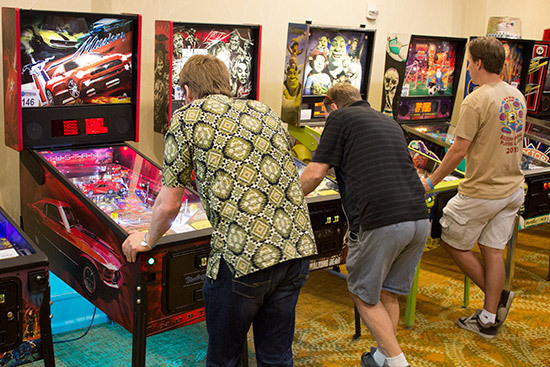 That last PinChat came from the Spooky Pinball Team of Charlie, KT, Squirrel and Bug. 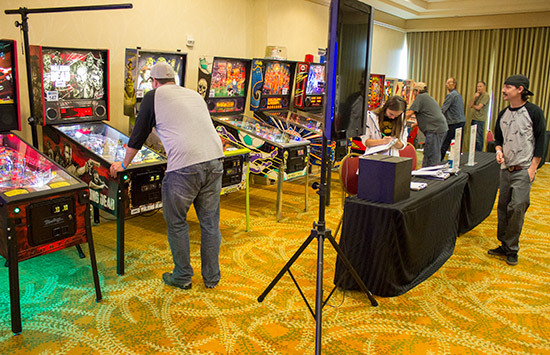 Charlie hosted and started by showing a series of pictures from the Spooky Pinball factory showing the building of America's Most Haunted, along with the bar in Benton, Wisconsin, where the very first AMH to be built is still on location. 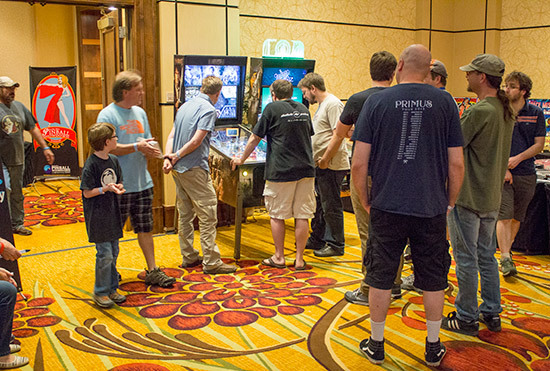 But the big announcement of the PinChat was the theme and title of Spooky Pinball's second game. 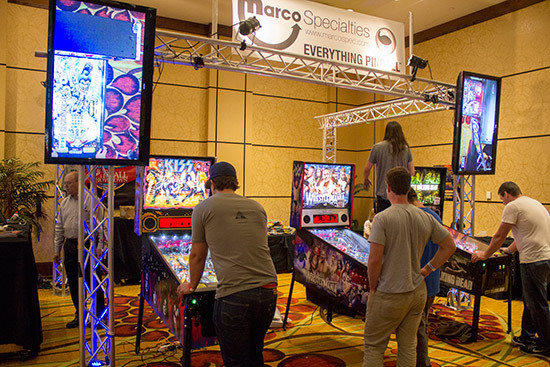 Rob Zombie's Spookshow International was revealed through a video featuring Rob Zombie and detailing the ten songs to be included in the game, as well as the artist who will be providing the playfield, cabinet and backbox artwork. 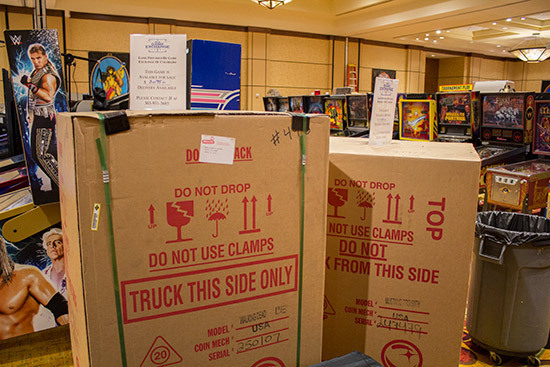 The production run will be limited to 300 machines. They will be priced at $5,995, or $500 more for a Limited Edition model which will initially be offered exclusively to buyers of America's Most Haunted. 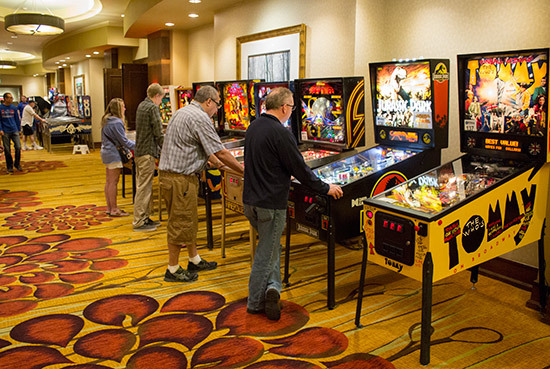 Meanwhile, in yet another side room, the tournaments were starting up, with the qualifying rounds of the Open, Solid-State and Electro-Mechanical competitions. 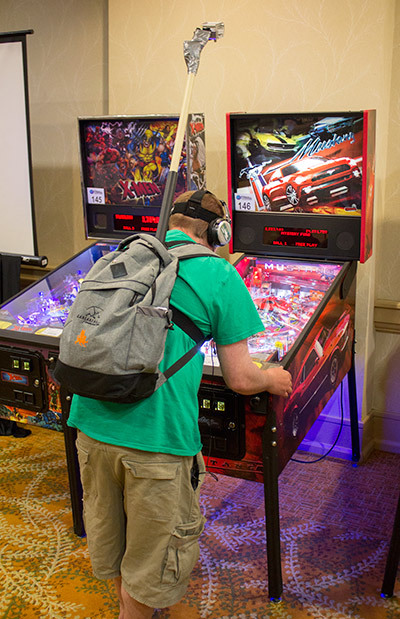 The Open Tournament was held on six machines: X-Men Pro, Mustang Pro, The Walking Dead Pro, Shrek, World Cup Soccer and Doctor Who. 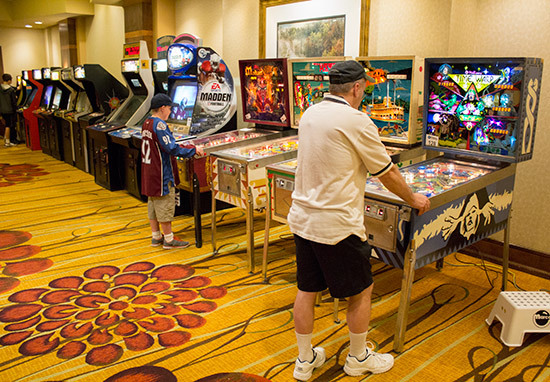 Players registered scores on all six, with their highest score counting. 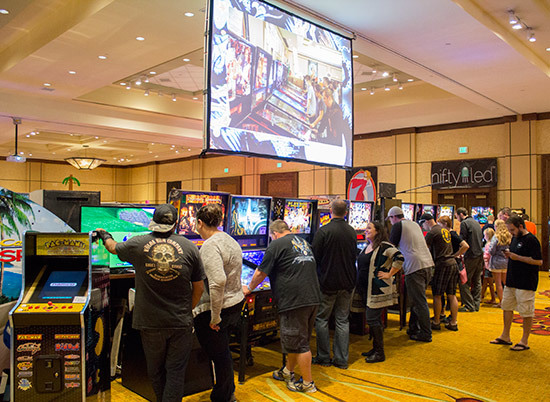 Each entry cost $6 and allowed two games on one machine, so six entries were needed as a minimum to record a score on each of the machines. Their overall score was the total of their ranking points on all six. 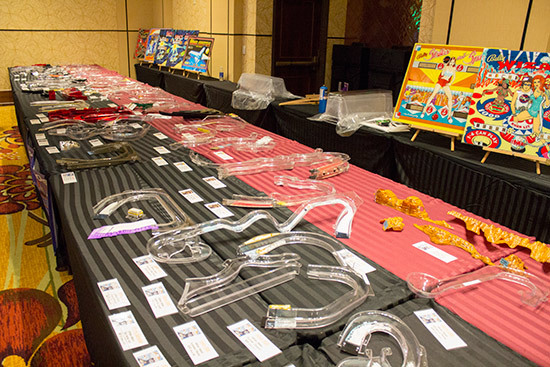 Unlimited entries could be bought during the qualifying period which ran all day during show hours on Friday and Saturday, and 9am until 11am on Sunday. The top 16 ranked players qualified for the play-offs which began at midday on Sunday. 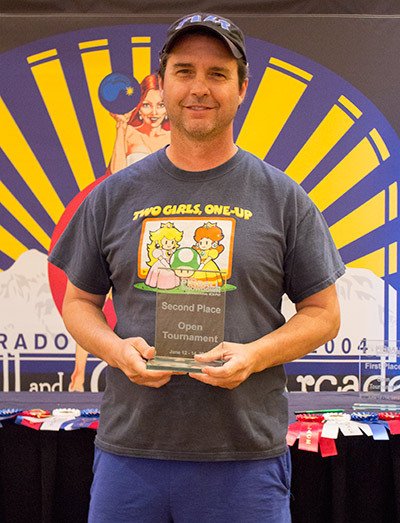 The play-offs were double-elimination with best-of-three matches in the wnner bracket and single games in the loser bracket. The final was between Donavan Stepp who remained undefeated, and Trent Augenstein who won the loser bracket. Trent would need to beat Donavanin two best-of-three matches to win the final, whereas Donavan woud only need to win one of those matches. Donavan had the first pick of machine and chose The Walking Dead. The Walking Dead had been a reliable 'banker' for Donavan throughout the tournament and, after a nervous start for both players with scores of around 5M after the first ball, it proved to be a good choice again. Ball two gave Donavan a lead of 67.6M to 6.1M, and the third ball only extended his lead, finishing on 100.6M to 15.6M. Neither player had a great game, but Trent's first ball score of 9.6M to Donavan's 1.6M set the pattern for the rest of the game. Donavan made a third ball come back from his 2.5M second ball total, but couldn't reach Trent's 14M final score, ending on 9.2M. 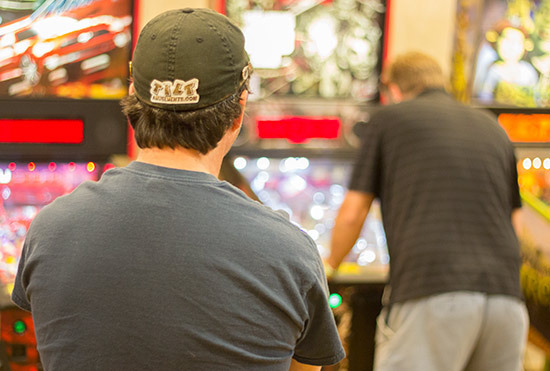 The same machine couldn't be picked twice in succession, but it could be picked twice in the same match, so Donavan took the final back to The Walking Dead for game three. Trent needed to win this game to take the final to a second best-of-three match, and he got off to a good start, scoring 29.7M against Donavan's 13.4M. Ball two saw Trent extend his lead with 94.7M to 48.7M. 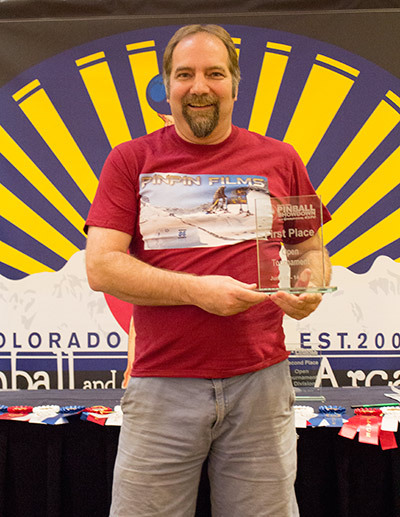 But Donavan turned the tables on the game and the final with his third ball, where he had Well Walker Multiball and Blood Bath running simultaneously with several Multi-Kills to rack up an impressive total of 155.9M. Trent's third ball only added 14M to his total, meaning he finished on 108.9M. Donavan had won the final 2-1. 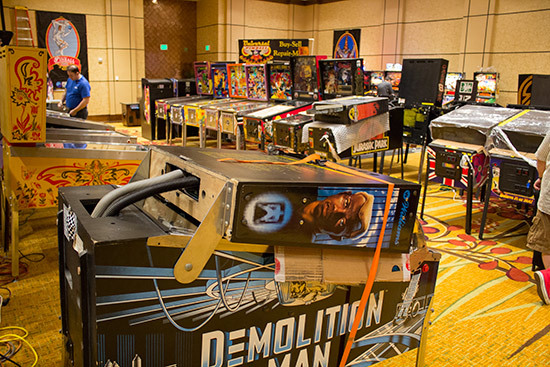 Just before the main tournament prizes were presented, the 'best-in-show' awards were announced for the most popular machines on the show floor as voted by attendees. 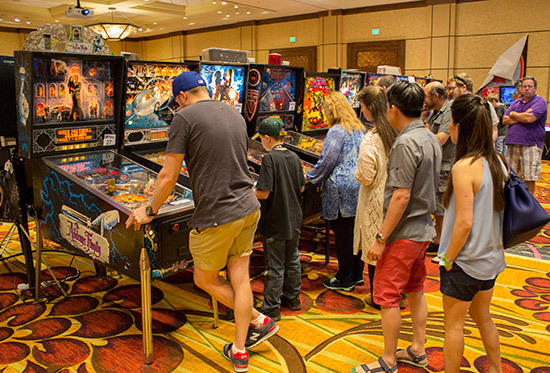 We'll be back with regular updates from the Rocky Mountain Pinball Showdown & Gameroom Expo, but in the meantime here our exclusive Pinball News Ten Minute Tour of the show.